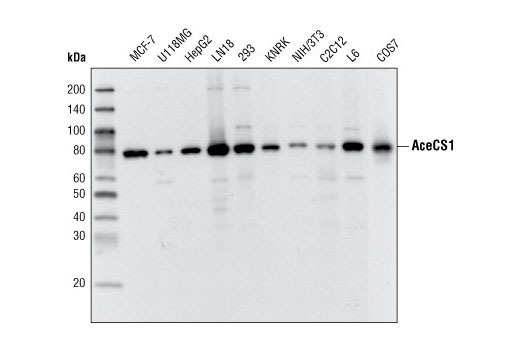 Western blot analysis of extracts from various cell types using AceCS1 (D19C6) Rabbit mAb. AceCS1 (D19C6) Rabbit mAb detects endogenous levels of total cytoplasmic acetyl-CoA synthetase (AceCS1). Monoclonal antibody is produced by immunizing animals with a synthetic peptide corresponding to the sequence of human cytoplasmic acetyl-CoA synthetase (AceCS1). Cytoplasmic acetyl-CoA synthetase (AceCS1) catalyzes the conversion of acetate and CoA to acetyl-CoA (1, 2). Acetyl-CoA synthesized by AceCS1 is used for fatty acid and lipid biosynthesis (1, 2). Studies suggest that this enzyme is regulated by sterol regulatory element-binding proteins (2). It was also shown that this enzyme is acetylated by protein acetyltransferases in cells (3, 4). SIRT1 deacetylates this enzyme at Lys661 resulting in its activation and the increase of fatty acid synthesis (3, 4). Ikeda, Y. et al. (2001) J Biol Chem 276, 34259-69. Luong, A. et al. (2000) J Biol Chem 275, 26458-66. Hallows, W.C. et al. (2006) Proc Natl Acad Sci U S A 103, 10230-5. Schwer, B. and Verdin, E. (2008) Cell Metab 7, 104-12.